May. May is when I will be getting my teeth implants, and with the month of April dedicated to maintaining my jaw/mouth opening, I will be in the best shape I have been since that fateful day in December. A big part of going back to work outside the home, is celebrating the recovery process thus far. So much is involved in recovery, and no small part of it is the support that people give. Matt & I have been supported for the last three months by so many people in our community, and we wanted to give back. Sharing Matt's artwork with our community was also a big drive in our want to bring people up to the house. Understanding the scope of Matt's work is always a discovery, even to collectors. We also love a good party! So then came the planning of our Open House. This all came to pass this last Friday, March 26th on Prince Kuhio Day. About 40 of our friends, and family joined us for the celebration. Seeing everyone together, and sharing the food that we prepared was fun. The day and night was filled with art tours, laughter, and hugs. Much imbibing was to be had into the late night hours. It was sweet. I want to thank all of you that could attend, and even those of you that couldn't for your continued support. During the preparation of the food that began the day before the party I snagged a few photos. During the party on the other hand, I was having too much fun to get any photos. The above is a shot of The Dirty Southern Casserole. The Dirty (as it is referred to) was demolished early on. Keeping it a secret is our price for perfection! OOHHHH The Dirty! 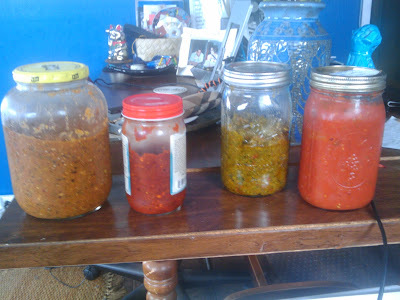 Also pictured are the jars of our roasted veggie salsa, fire hot salsa, pesto, and marinara, and Matt's latest painting a study of William Bouguereaus' Young Shepherdess Standing. 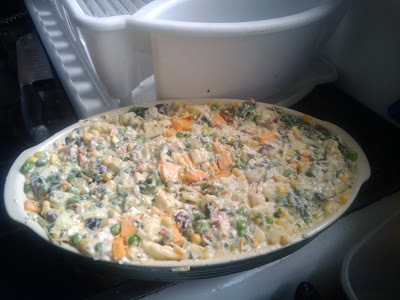 I will be blogging about the food we prepared for the Open House on upcountryrecipes.com soon. I am so glad we had the function on a Friday. We needed the weekend to recover! After the party we got up at midnight Saturday night to watch the World Cross Country Championships (thank you letsrun! ), followed by an (successful!) appointment Sunday morning. Good times. Loving life!